I hope their not praying with that blunt/cigar in his hand? 1st Beyotches. What the hell are they doing? In the words of Juiicy: They are praying to baby Jesus. Beyonce & Jay-Z are thanking Zenu for taking Rihanna away. That picture is very old. NO better yet Beyonce is praying that rihanna away.and jay saying "Think ya jesues i have 2 hotest women in the business. 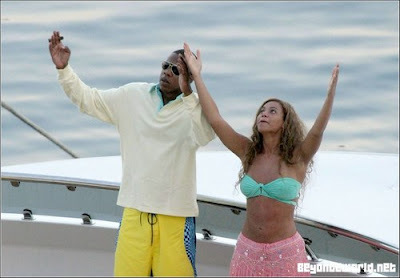 jay instructing b "if you want people to take pictures of your armpits (i don't know why) at least make it look like your praising god and not checking to see if your deodorant works"
HOVA HOVA HOVA HOVA! This fool is praying to himself. They are thanking god, that Rihanna stopped singing! This cannot have effect in actual fact, that's what I consider.